Why does a complete bass string set require measurement with the 'A' and 'B' system but for individual strings the beginning and end of the copper windings? With the ‘A’ and ‘B’ system an even final copper line is achieved across all bass strings. We add to your ‘A’ measurement 8mm and subtract 24mm from the ‘B’ measurement. When tuned the distance between copper begin and the bridge is about 10mm and from copper end to the v-bar/agraffes about 16mm. If only individual strings are replaced in an old set of strings, then these distances would not fit. Therefore, with individual strings, it makes more sense to measure from the hitch pin eye to the copper begin and from the eye to the copper end. In this case you must also state whether measured tensed or non-tensed. Do you make the new bass strings based on the old diameters or do you re-calculate the scale? 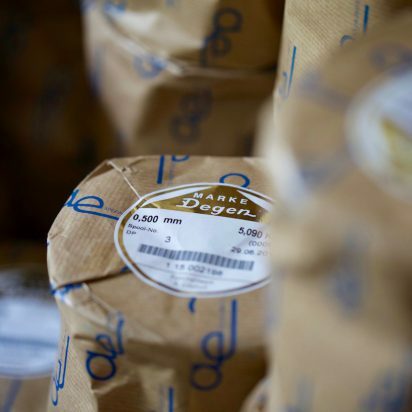 We optimise the diameters according to our long-standing experience in order to obtain the best results. But if you require an exact copy of the original diameters or if you have included a self-designed scale, please make it clear that you do not want optimised dimensions. Incidentally, we also offer re-calculation of the (non-wrapped) plain wire strings … please contact us for more details. 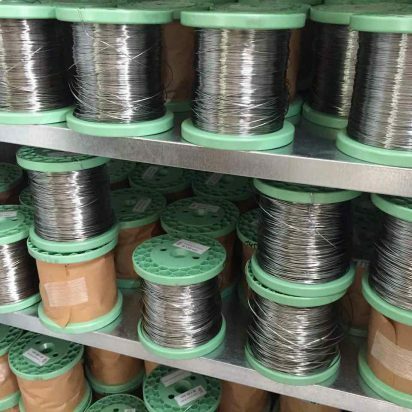 What core wire and windings wire do you use? 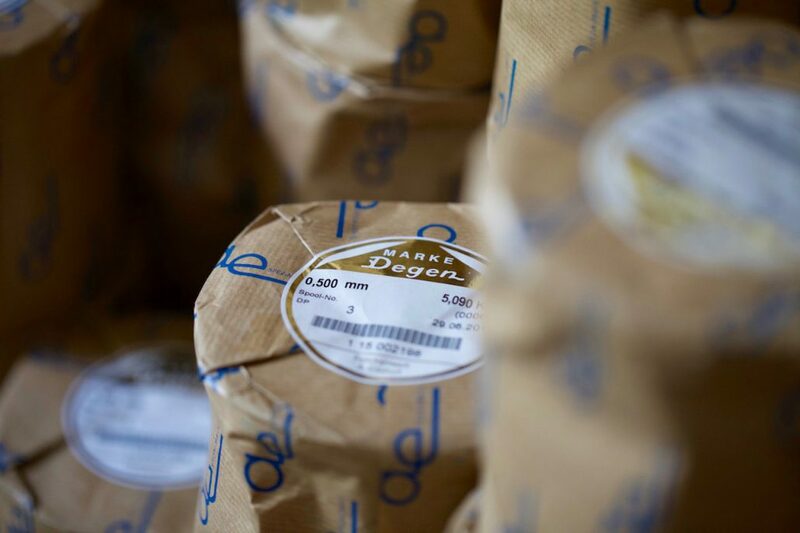 For the core we use the Röslau brand and various types of the French Paulello wire. 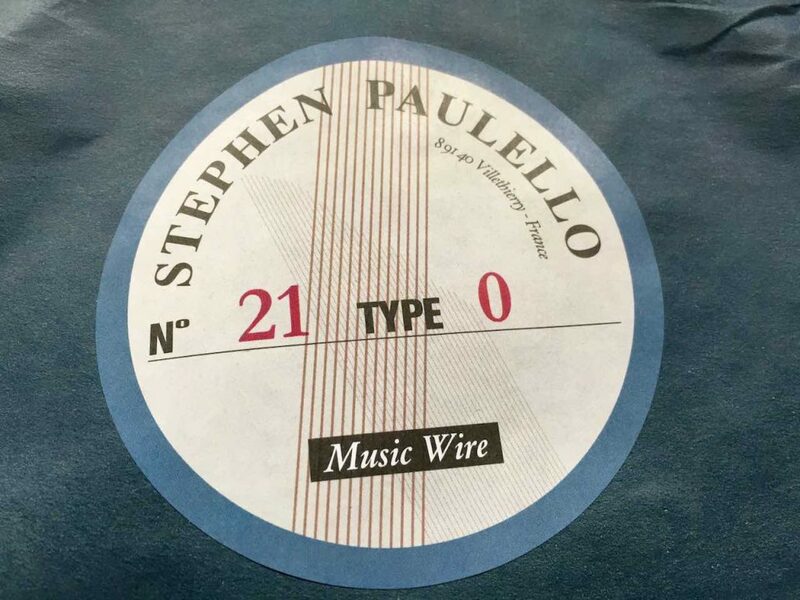 We use type 1, 0, M and XM, as well as the nickel-plated version of type M. For the windings we use copper, tin-plated copper, brass, iron and the nickel-plated iron wire from Paulello. I heard of hybrid scaling ... what's that? 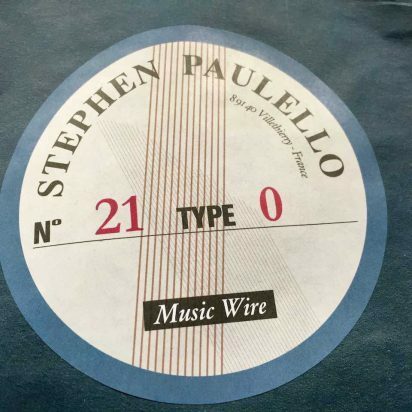 Stephen Paulello from France has supplied his ‘Paulello’ wire for many years. We have offered this wire from the beginning. There are various hardness types (M, 0, 1) for the different piano construction eras. The breaking point of the individual types varies. By employing various string types within one set of bass strings, one can keep the breaking point percentage to an appropriate level (not below 50%). What are the different hitch pin eye types called? The short eye is called German eye, hand eye or normal eye. This has mostly one ring around the hitch pin (single German eye) or two rings around the pin (double German eye). The steel end (the tag) usually points to the right, looking from the string to the eye. The long eye – our standard if not otherwise specified – is a French eye (plaited). The length of this eye can differ from 25mm to 75mm. If not otherwise specified, our standard is 55mm. But if the bridge is very close to the hitch pins, we will automatically reduce the length of the eye. Some customers prefer a German eye if the distance between hitch pins and bridge is very small…this string area is then more flexible without the French eye and is less likely to impair the vibrations at the bridge. Can I order complete sets of bass strings without supplying the A and B lengths ... i.e. only giving the make and model? We are reluctant to take on such orders, because the bass bridge and hitch pin bore holes are different from instrument to instrument; even with identical models there are slight deviations. The bass bridge – even in high quality brands – over the years is installed with variance between 1 to 3cm, and some brands even employ different iron frames in one and the same model. Without the A and B lengths the usual precise copper end line cannot be achieved. At least the serial no. or the year of manufacture is required to keep the deviation to a minimum. Do Hellerbass strings have to be turned ... and how many turns? Yes, we recommend two full turns for the single wound bass strings… and a half turn for double wound bass strings. The copper rises to the left, so they must be turned to the right – i.e. clockwise. There are a few exceptions, because in some factories the spin machines turn the opposite way. If requested we can also offer this alternative, in which case the string would need to be turned anticlockwise. Something regularly causes confusion: no matter where your standpoint, at the bottom or top end of the instruments, the string must be turned in the same direction. One can imagine a wet towel…to wring the water out of the towel it must be twisted in the same direction from both ends. Your special tape measure is 5mm too long ... is that possible? Don’t worry…the tape measure is correct; our A and B lengths begin from the front edge of the hitch pin…i.e. not including the diameter of the pin. If we then add the 1mm diameter of the steel wire, which we use to make our tape measure, then it results in 5mm deviation. If you use our tape measure, the lengths will correspond perfectly to our system in the production. Why do I not receive an invoice for my individual string order straight away? We try to avoid invoices for small amounts and prefer to wait until a larger sum is reached. Nevertheless, invoices are sent in the mid-year or the end of the year at the latest. Of course individual strings will be invoiced earlier if, for example, a complete set of bass strings is ordered. I require a replacement for a missing string ... which data are needed? Measure the A and B lengths with our special tape measure (order here). If a single string, measure the overall thickness and core size of the two neighbouring strings. We will then calculate the appropriate diameter. If the note is a bi-chord, give the overall diameter of the partner string and its core size. Knowing the name of the note is also helpful…then we can calculate the load percentage to prevent the new string breaking. Do bass strings have a 'best by' date? We recommend installing newly delivered bass strings as soon as possible. Please do not wait several months before installing … the sooner the better. The strings should definitely not be left for weeks or months in the box they came in. After delivery unpack the bass strings straight away and hang them on a nail in the wall. Do you use fully automatic machines for making bass strings? No – in our firm we value hand skills. 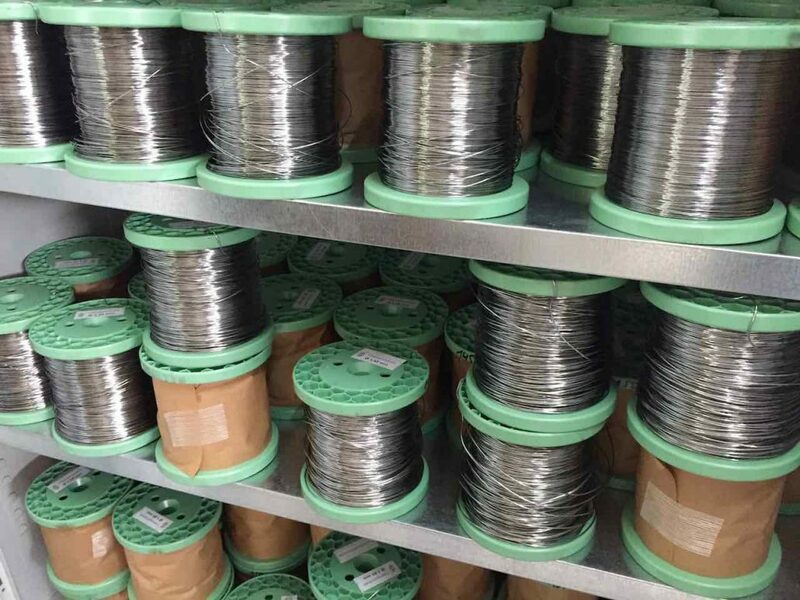 We feed the copper wire onto the core manually and every string is made individually according to requirements. We don’t mass produce and each string is inspected before it leaves our workshop. Normally we can send a complete bass set within 1-2 weeks of receiving your order. Individual strings: within 1-3 days. If extremely urgent, please contact us…in such cases we can react quickly … without extra charge. We send complete bass sets almost exclusively with UPS (United Parcel Service). Our experience with UPS has been very positive, both within Europe and world-wide. Individual strings are normally sent per post…or DHL airmail in other countries. For express deliveries UPS is also available.